I love Kylie Kwong, and her recipes. For some reason she reminds me of my sister, I think it’s her mannerisms. I wish I had more time to create some of her other recipes. One of my favourites is her fried eggs. It’s so simple but really tasty. The thing that makes it is the white pepper, and crispy deep fried egg whites. Make it, you’ll like it. I asked around at work today what to cook for dinner tonight with chicken. Sometimes I get cookers block. I have hundreds of ingredients but I get stuck, especially if I don’t hanker after something in particular. The general consensus was stir fry and noodles, this would guarantee there would be plenty of leftovers to share for lunch tomorrow. Does anyone else feed their workmates? If I can’t do this cooking thing for a living I may as well feed the people for free 😄 I decided on Kylie’s Hokkien noodles with pickled vegetables. 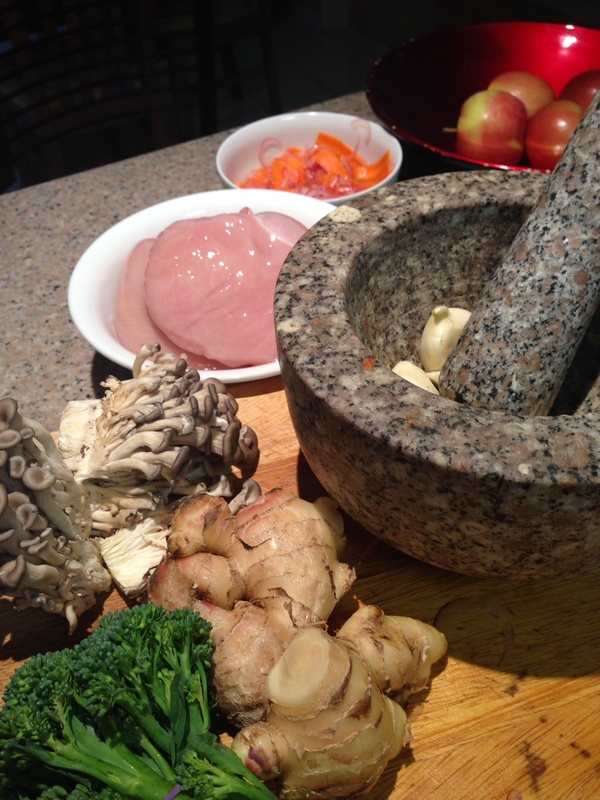 It sounds odd, pickled veggies with a chicken stirfry, but it works. 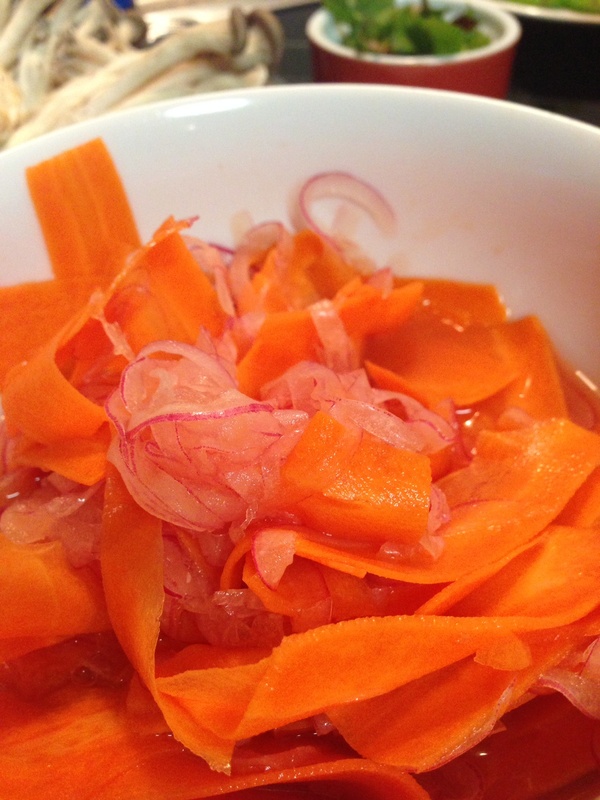 Make the pickled veggies first so they can steep for as long as possible. I used my VSlicer to mandolin the 2 small carrots and one small onion. Combine 1/2c rice wine vinegar, 2tsp fish sauce, 1 tb sugar, and I’ve just realised I forgot the 2tsp sea salt, whoops. Oh well, it seemed to work without it. Put all the ingredients into a bowl and set aside. This is what it looks like after a couple of hours. 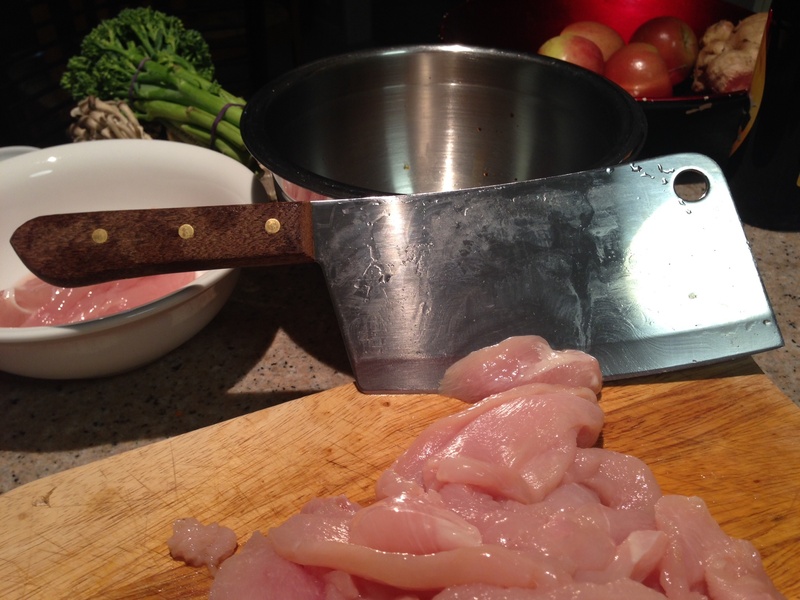 This next photo is not to show you how to chop chicken, it’s not that hard, it’s to show you my big knife. Any excuse to bring out the big guns, eh? My meat cleaver, I love it. Chop the chicken, pound the garlic and ginger to form a paste in your mortar and pestle, add half the paste to a bowl, add the Kecap manis, black vinegar, 1/3c shao hsing wine, Worcestershire, soy and chicken and squish with your hands til all combined. Refrigerate for at least an hour. Meanwhile cook the noodles as per the packet directions and set aside. 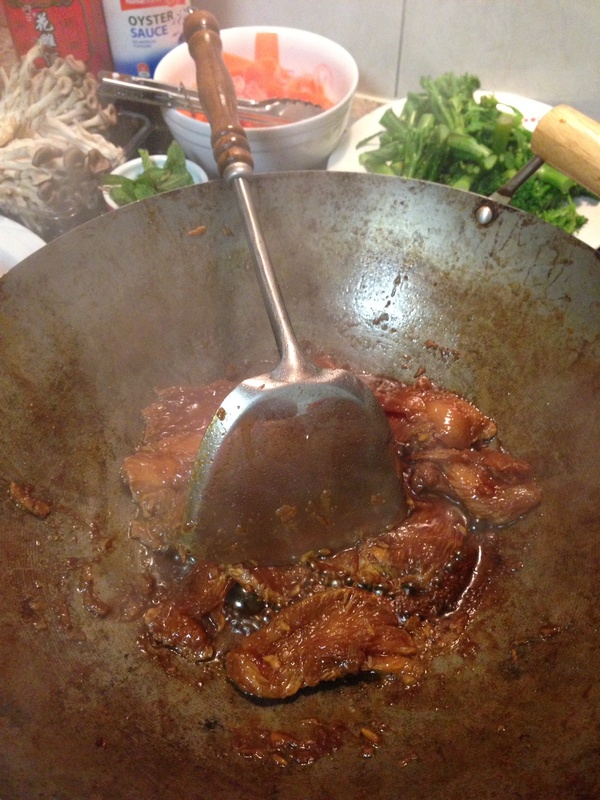 Heat oil in a hot wok until the surface seems to shimmer slightly, stir-fry chicken in batches for about 2 minutes, or until almost cooked. Remove from wok and set aside. Add remaining ginger and garlic paste, add mushies and broccolini and stir-fry for a couple of minutes til almost cooked. 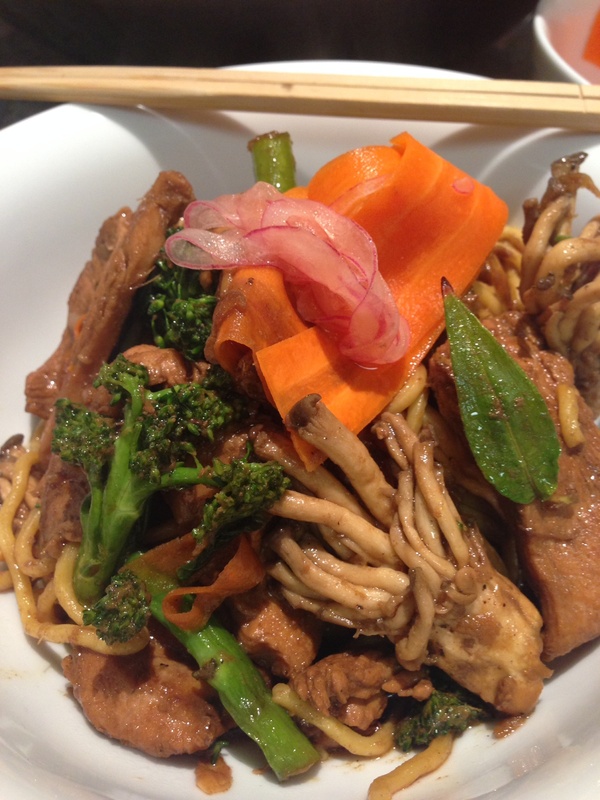 Add remaining 1/3c shao hsing wine, pickled vegetables, oyster sauce and stir-fry for a further minute. 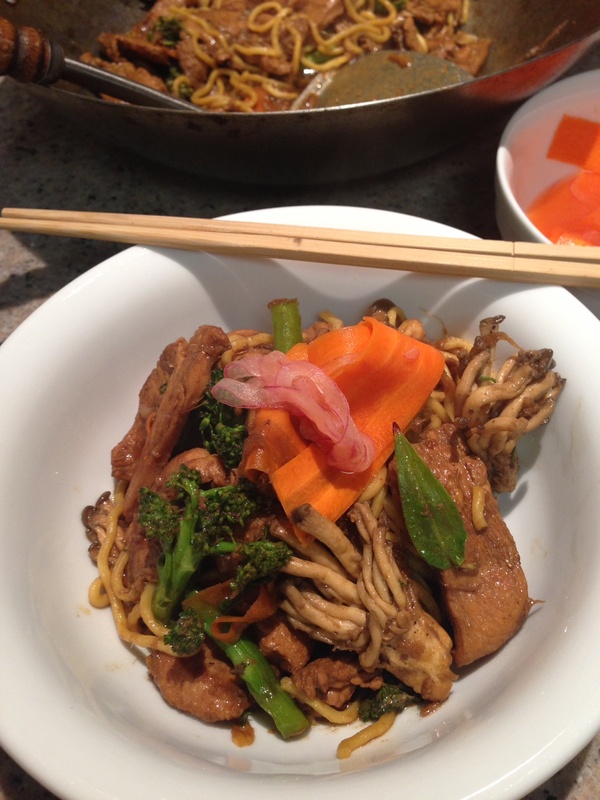 Return chicken to wok and stir-fry until chicken is just cooked through and add noodles and mint and serve. 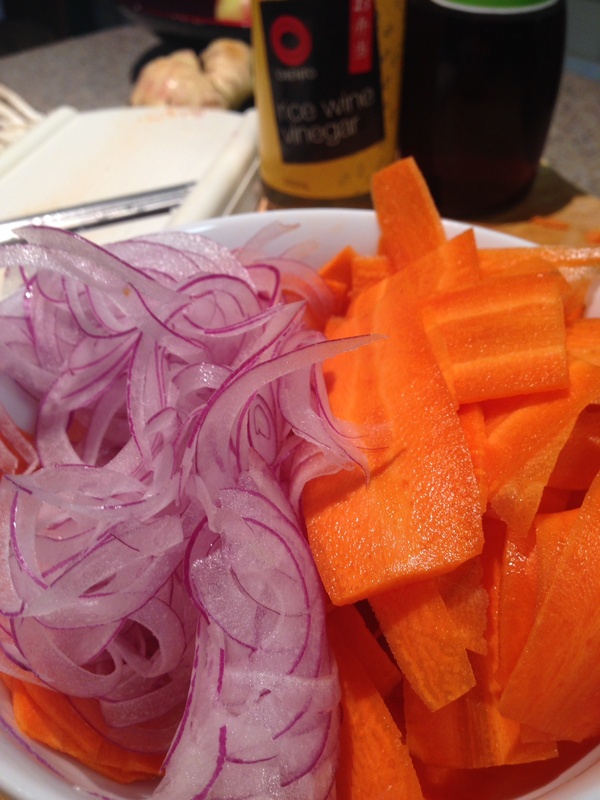 I added some fresh pickled veggies on top and it gave it a great crispy, zingy freshness. I’m sure I’ll be able to use the remaining pickles in another meal, even Tweenie kept picking at the pickles after dinner, much to my surprise. I also cooked up a big batch of rice so there would be plenty of leftovers for work tomorrow. Do you try dishes that seem to put together odd ingredients? It was good. Although I’d double the sauce next time as I like my stirfries saucy.